printing, making new friends, and chilling out! Come along with your own design ideas, or work with the awesome Minus18 Crew, the drum staff, and a professional art teacher to come up with something amazing. WHAT TO BRING: Something to screen print on! This can be anything from a t-shirt to a rad denim jacket, but you will get the best results if the area you wish to print on is flat & smooth. 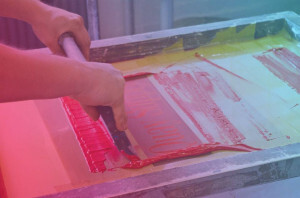 Screen printing involves inks that stain, so remember to wear clothes you don’t mind getting messy – we’d hate for your favourite outfit to get ruined! Meet the Minus18 Crew at Flinders St Station at 11:30AM to …get the tram there, or meet there at 12:00PM.